Admission procedures -- Follow the general admission procedures of the college as outlined in the catalog and/or special procedures outlined for prospective Doctor's students. Previously Earned Degree -- Have completed the Graduated Specialist degree in his/her proposed field of study. Church Involvement -- Have satisfactorily completed one summer of study in an assigned church situation, culminating in a write-up of the assigned church situation, culminating in a write-up of the assignment experience. The written report will be critiqued by an appropriate selection of pastors and college faculty. Class Attendance -- Commit himself/herself to regular class attendance. Any student who is absent more than four times for any reason is subject to being dropped from the program. Special attendance problems will be considered, but each student should understand that attendance, as with all that we do, should be as "as unto the Lord" (Colossians 3:23). Courses and School -- Follow and satisfactorily complete course requirements as outlined in the College catalogue. Collectively, courses are designed to help each student develop/extend the attitudes, knowledge, and skills needed to serve effectively in his/her field of ministry. No grade below a "B" will be accepted toward the doctor's degree. A student who earns less than a "B" grade will be appropriately counseled with respect to course adjustment, program change, or suspension from the doctor's program. Again, the Christian student should understand that his/her goal should be, to be, or to become a "workman who has no cause to be ashamed, correctly analyzing and accurately dividing - rightly handling and skillfully teaching the Word of Truth" (2 Timothy 2:15b), and those matters relating to the Word of Truth. Dissertation-- Write a dissertation (a written report of an original investigation) in his/her field of study which will contribute new and useful information to that field. The dissertation must be based on an on-going ministry or other work or need for one or more selected churches and should be useful to the church(es) involved and/or to churches (local congregations) in general. 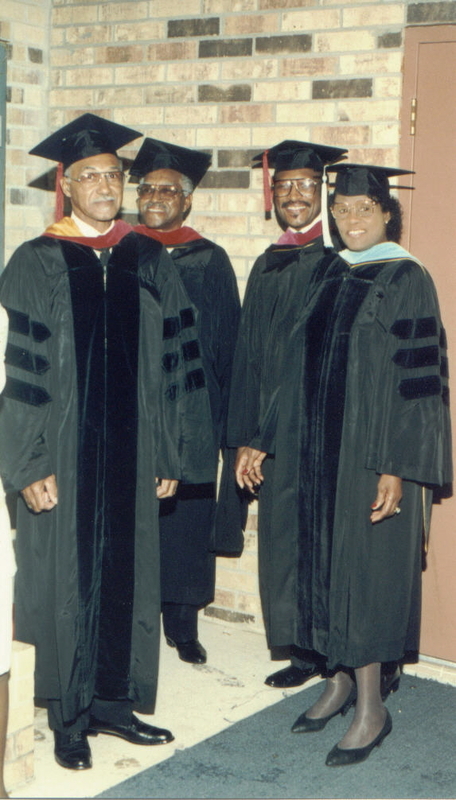 All phases of the dissertation must be carried out under the guidance of selected pastors and instructors. Studies/investigations involving questionnaires to the church memberships and/or other groups must contain responses from at least fifty respondents (persons), with a goal of reaching as many more as possible in small churches or other small population groups, and fifty percent of the students of Christian Bible College. The dissertation should be completed at least one month before the students' expected date of graduation. Other specifics relating to the dissertation will be given in the college catalog and/or in special communications to students enrolled in the Doctor's program. Meeting Requirements for Graduation -- Meet all requirements for graduation as prescribed and scheduled in order to be eligible for graduation at the end of one regular school term plus the following summer term. A student who fails to meet requirements for graduation as initially scheduled must have his program adjusted according to the requirements involved. When all such requirements have been met, a revised date for graduation will be set.